Please enjoy this stunningly inadequate photo of the recipe I'm about to give you. Last week I was the guest "chef" at the wonderfully fabulous Hip Donelson Farmers Market. If you are anywhere within driving distance of Donelson/Nashville on Friday afternoons, I strongly recommend you make a trip--so totally hip and wonderfully fabulous. "Kale, kale, kale. And kale. Oh, and lettuce. And kale. Nothing else is growing, but the kale sure is doing great!" Ok, then. You know how well that went over when I told Ella that the recipe would feature kale? She was polite but firm: "Mama, you know kids don't care much for kale, right?" And that is how you dare me to make a recipe with kale that kids will love. 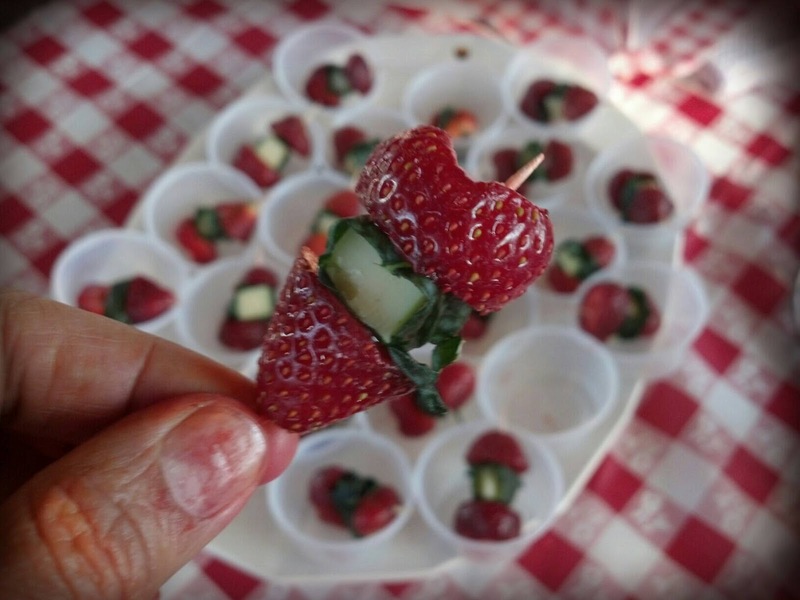 So without further ado, here is the recipe I presented at the cooking demos for the Hip Donelson Farmers Market last week--the recipe that I prepped 4 quarts of strawberries for and ran out of samples because the kids kept coming back for more. This is a kid-friendly, healthy appetizer that they can even help assemble! NOTE: the cheese in this recipe is a local cheese produced by the also wonderfully fabulous Kenny's Farmhouse Cheese. You can use any cheese that is slightly salty and firm enough to hold its shape when cubed. To make the drizzle, pour balsamic vinegar into a small pan over medium high heat. Bring to a boil, then reduce heat and simmer, stirring often, until it reduces in volume and becomes the consistency of thin syrup (about 5 minutes). Remove from heat (it will continue to thicken), and pour into a bowl to cool. Meanwhile, massage the kale strips by rubbing them between your hands. When the leaves have darkened and softened in texture, they are ready. You can take a bite to test them--if they are still bitter, massage a little longer. To assemble, slice a strawberry in half across and thread the bottom half onto a toothpick. Wrap a strip of massaged kale around a cube of cheese and thread onto the toothpick so that it holds the kale in place. Thread the top of the strawberry onto the toothpick, creating a "sandwich" with the kale-wrapped cheese cube in the middle. Sprinkle with salt and pepper, then drizzle balsamic reduction over the bites and serve immediately. I love kale and this sounds Delicious!